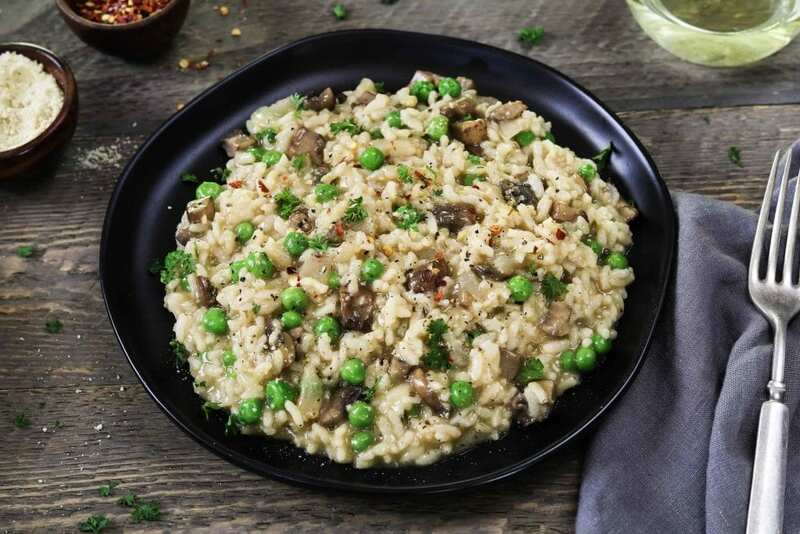 Cut your cook time and effort in half with this Instant Pot Mushroom Risotto. It takes just 15 minutes and you don’t have to keep stirring. Yes, it’s true! You can make perfectly rich & creamy risotto right in your Instant Pot! 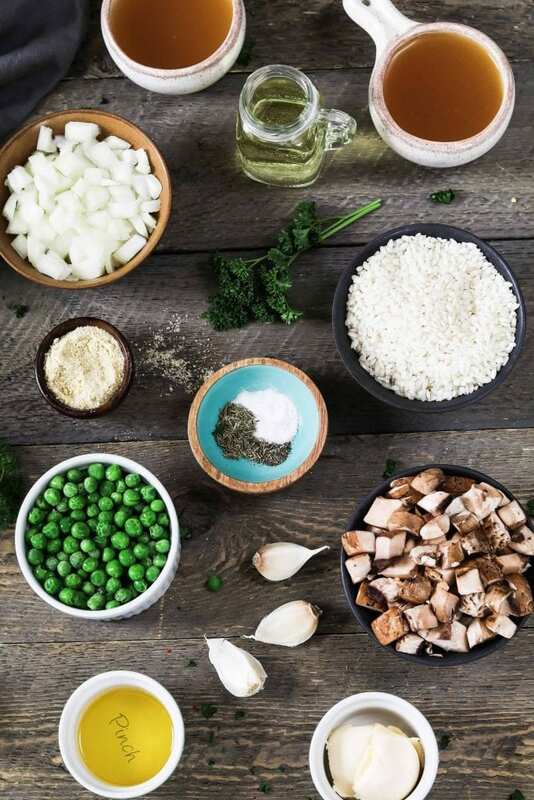 A traditional risotto is quite easy to make, but it takes time and you have to keep a constant eye on it. 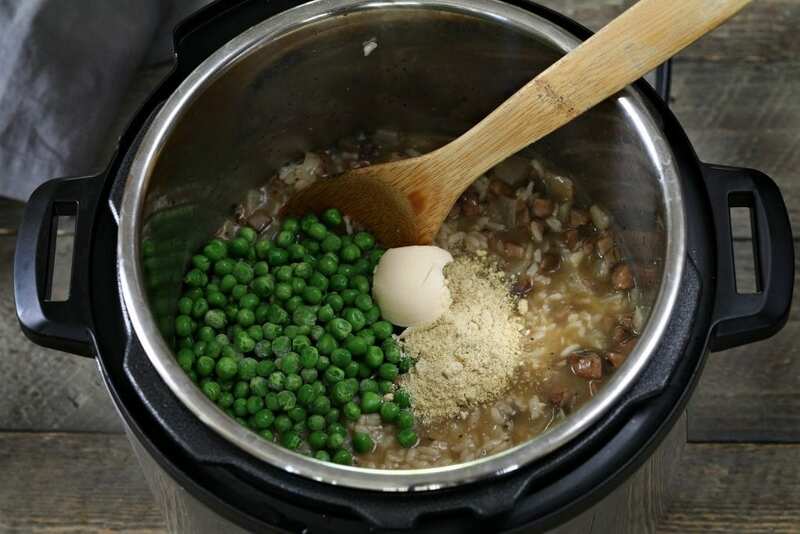 This Instant Pot Mushroom Risotto reduces all that so it’s perfect for busy weeknight meals. 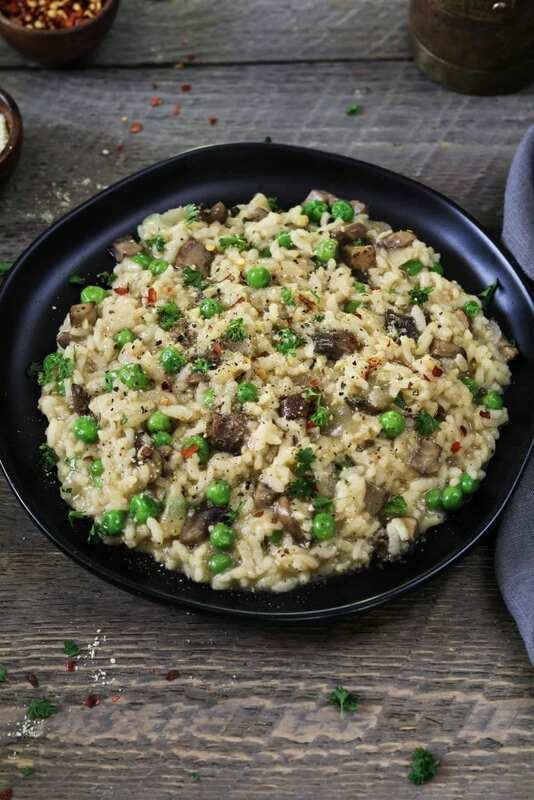 * If you’re not ready to dive into the Instant Pot world, you can make my stovetop Vegan Mushroom Risotto instead. It’s delicious! I actually love making stovetop risotto and I find it very therapeutic, so I won’t be giving it up. However, I usually reserve it for the weekends when I have more time. Things are hectic here during the week, but I still like to have comforting and wholesome meals on the table. 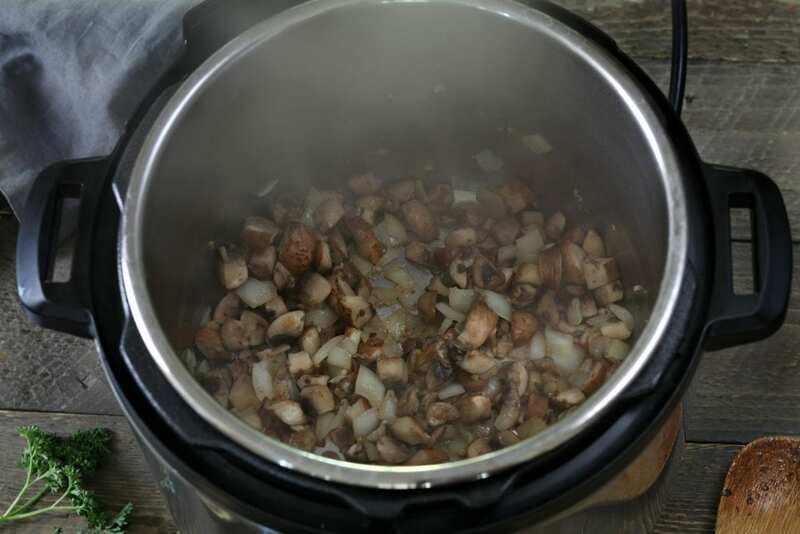 The Instant Pot has been a lifesaver and I use it at least 4 times a week. It doesn’t actually cook in an instant, but it’s easier and you can walk away while it goes to work. Some optional ingredients are red pepper flakes, fresh-cut parsley, and vegan parmesan cheese. Turn on the Sauté feature of your Instant Pot and add the oil & butter. When melted, add the onions and sauté for 2-3 minutes until slightly translucent. Now add the minced garlic and dried thyme. Sauté for 1 minute to lightly brown the garlic. Add the diced mushrooms and sauté for another 3-4 minutes until tender. Add the arborio rice and stir to coat it well. Now pour in the wine and cook for 2 minutes until the liquid mostly cooks down. Stir in the broth, salt, and pepper then close and secure the lid. Turn the steam release handle to the sealing position. Cancel the Sauté function and push the Pressure Cooker (Manual Setting) button to high pressure. Set the time to 6 minutes by using the + or – button. The screen will then display ON while the preheating is in progress (this could take 7-10 minutes). When the Instant Pot has come to pressure, you’ll see the 6 minutes displayed on the screen again. The cooker will beep when the time is up. Carefully turn the steam release handle to the Venting position for a quick release (It will loudly spurt out lots of steam and some water). Once the Float Valve goes down you can carefully open the lid. The risotto will look soupy when you first remove the lid but don’t worry this is normal. Just give it a few good stirs and It will thicken up nicely. Now stir in the thawed peas, remaining vegan butter, and vegan parmesan. Taste for seasoning and add more if needed. I usually add a pinch or two of salt. Serve immediately and sprinkle with your favorite toppings like fresh-cut parsley, crushed red pepper flakes, vegan parmesan, squeeze of lemon, or fresh cracked pepper. It goes great with a nice glass of white wine too! 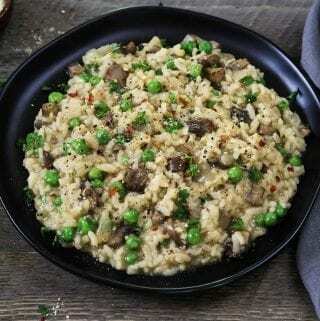 If you make this Instant Pot Mushroom Risotto, let me know what you think by ★ star rating it and leaving a comment below. It would really make my day. You can also follow me on Instagram and share your creation with me. Just tag me @veganhuggs and hashtag #veganhuggs so I don’t miss it. 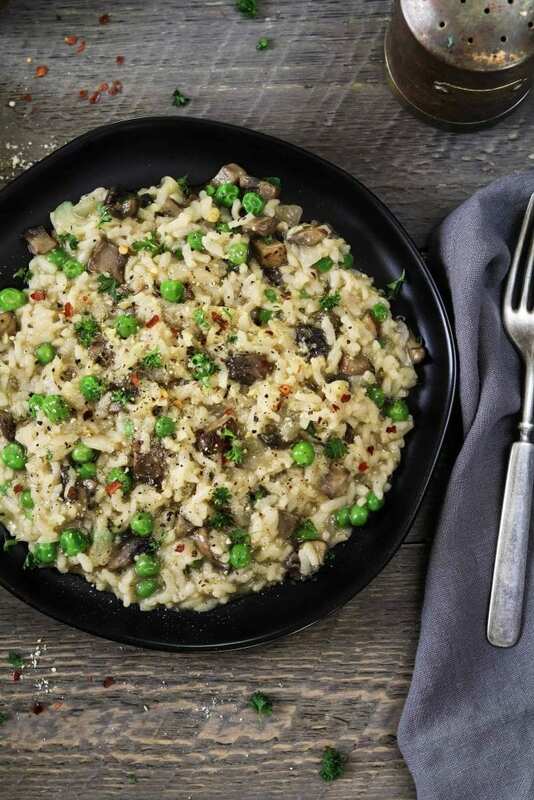 Cut your cook time and effort in half with this Instant Pot Mushroom Risotto. It takes just 15 minutes and you don't have to keep stirring. Turn on the Sauté feature of your Instant Pot and add the oil one tablespoon of butter. When heated, add the onions and sauté until slightly translucent, about 2-3 minutes. Add the garlic and thyme. Sauté for 1 minute. Now add the mushrooms and sauté for 3-4 minutes until tender. Pour in the wine and cook until the liquid mostly cooks down. About 2 minutes. Cancel the Sauté function and push the Pressure Cooker (Manual Setting) button to high pressure. Set the time to 6 minutes by using the + or - button. The screen will then display ON while the preheating is in progress (this could take 7-10 minutes). When the Instant Pot has come to pressure, you'll see the 6 minutes displayed on the screen again. The risotto will look soupy when you first remove the lid. Just give it a few good stirs and It will thicken up. Stir in the peas, remaining butter, and vegan parmesan. Taste for seasoning and add if needed. Serve immediately with fresh-cut parsley, crushed red pepper flakes, and fresh cracked pepper. Enjoy! * Vegetable Broth: I like to use low sodium broth, so I can control the salt taste. Some broths are too salty and can ruin a good recipe. If you would like to use a regular broth, make sure to cut down the added salt in the recipe. * If you don't have homemade or store-bought vegan parmesan, you can add 1-2 tablespoons of nutritional yeast at the end or you can leave out the 'cheese' flavor altogether. It will still be delicious! * The cook time doesn't include the Instant Pot preheating time. This can take 7-10 minutes. *Consistency of Risotto: The risotto should be able to move on the plate and It will slowly spread on its own. 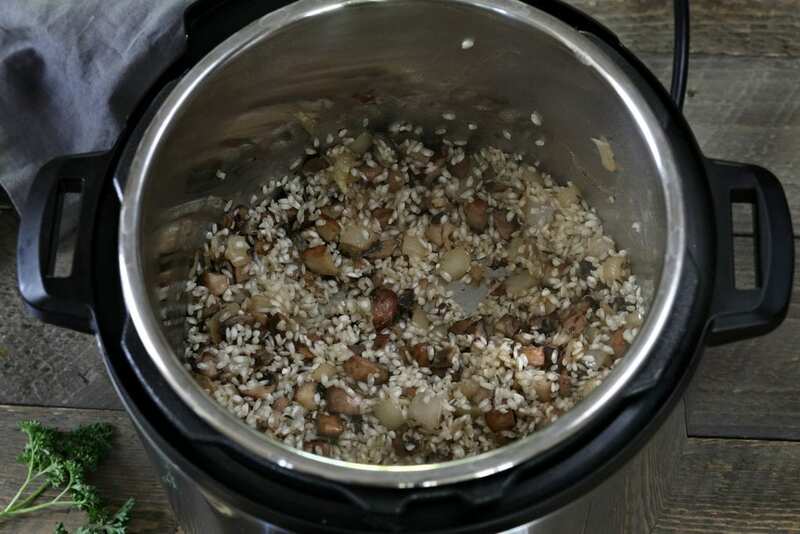 Would you need to change the cook time if using short grain brown rice? Hi Michelle, I haven’t tried it with short-grain brown rice, so I’m not sure how the time will need to be adjusted. I’m sorry I can’t be more help. I. too, was skeptical about an Instant Pot risotto but I’m a convert! I enjoy making risotto the slow way but sometimes there just isn’t time. Thanks for the great recipe. Hi Alan, I’m so glad you gave it a try! Thank you so much! Loved it! And so did our one and a half year old daughter. Way easier than making risotto the original way. Hi – Is there a non alcoholic substitute for the white wine? Thanks! Thanks! Can’t wait to try this tonight! Thank you for this recipe. It was really great in the instant pot. Instead of mushrooms I used wild leeks and fiddleheads. Amazing recipe. Well done. Tried this a couple of weeks ago and immediately put it into my weekly rotation. It’s perfect for gym night, because I can prep everything ahead of time, and then just dump everything into the Instant Pot and turn it on when I get home. Dinner is ready before I’m showered and changed, and it’s a satisfying post-workout meal. Would this work as leftovers? I’m wondering if I can prepare it a few hours in advance without compromising the texture too much. Hi Mandy, I’m sorry for the late reply. This comment landed in my spam 🙁 Yes, you can reheat it, but you’ll need to add a little broth to think it out. Thank you for stopping by. Would it be possible to make this with reconstituted/dehydrated mushrooms? If so, would that change the recipe at all? Thank you. I had tried a slow cooker risotto before that was awful, so I was skeptical about how this would turn out. But I made it tonight and it’s delicious! Very creamy consistency. Thanks! I have to admit that I didnt think a risotto could be done this way. Now after trying it I am very impressed. Fadtedt risotto I have ever made and its so delicious.